With fresh ingredients from Batanes to Jolo, Filipinos can unravel a myriad of local culinary treasures. Recently, yours truly was invited to partake in a campaign, The Sooo Pinoy Campaign. What is Sooo Pinoy? 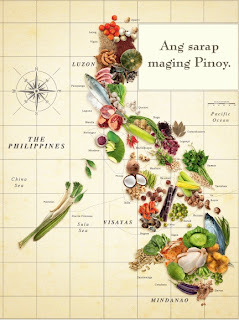 Sooo Pinoy is a campaign by Unilever Food Solutions Philippines to bring people all over the world as well as Filipinos residing everywhere else in the world to know, appreciate and to realize that the Philippines with its more than 7,000 islands, is a treasure for food finds. With many years of colonization from the Spanish regime, and years of cohabiting with our Muslim brothers and sisters, and our Chinoys (Chinese-Pinoys). The Philippines has grown rich in food specialties which has amazed many a celebrity such as Anthony Bordain. A movement that began in 2010, Sooo Pinoy focuses its advocacy on increasing Filipinos’ appreciation for local dishes. The movement enables people to learn more about Filipino cuisine and how it contributes to a better understanding of our nation’s identity. Last year, in partnership with the Department of Tourism, Sooo Pinoy set out to name the ultimate Pinoy dish. After public participation via voting, sinigang was crowned as the favorite fare across the nation. This year, Sooo Pinoy plans to make it bigger and better with the help of local businesses and restauranteurs to make Filipino Cuisines and the Philippines a worldwide culinary hub of fresh and delectable dishes! Rarely do I chance upon to eat and savor Spanish cuisine and as given the chance to dine, I would surely make the best of it. One time I got to dine at a exceptionally nice place in Greenbelt 5 called Tapella. So what came into mind with the Tapella, it seems quite obvious that these two dishes would come into mind Tapas and Paella, and that was indeed what we are having. The place had a very modern contemporary set up, away from the classic look that most Spanish cuisine-inspired places in the metro. And there was space all over, that was what I liked about it. A very relaxing and serene ambiance. 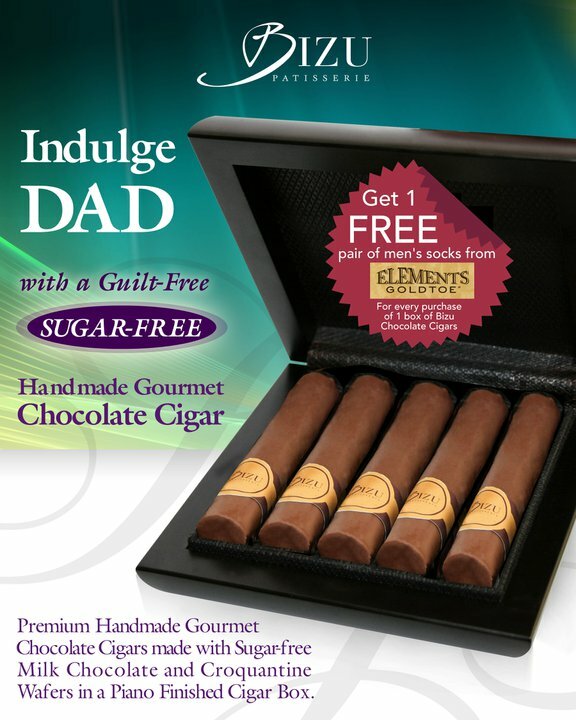 and get wonderful treats and freebies!! 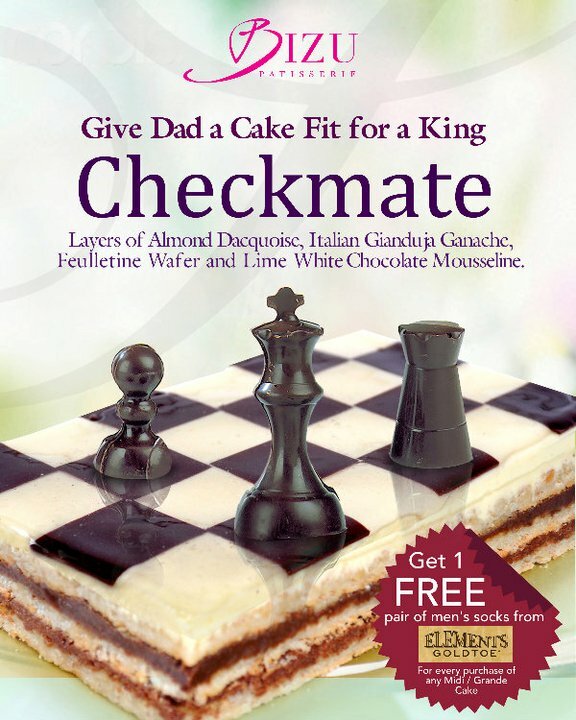 Get 1 FREE pair of Elements Goldtoe socks with every purchase of the Checkmate cake or the Handmade Gourmet Chocolate Cigar, only at Bizu Patisserie. On June 19, 2011 Celebrate Father's day at Reyes Barbecue. Reyes Barbecue happily honors all Dads! 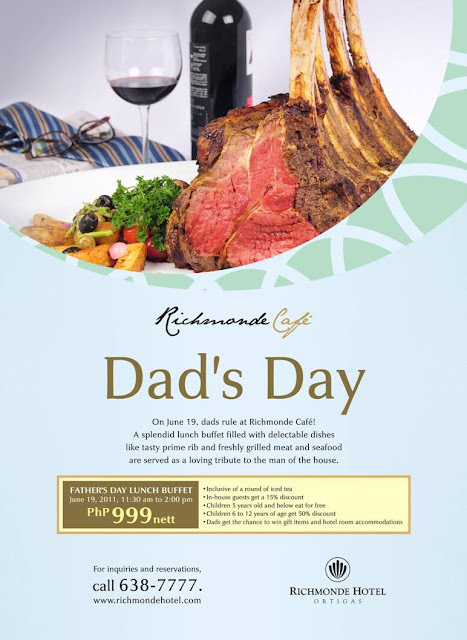 And to make this a very special day, Reyes Barbecue is giving a wonderful treat for Dads to enjoy. 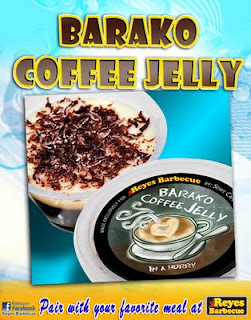 For every P1,000 single receipt purchase, ALL DADS in the group will receive Reyes Barbecue’s newest dessert –Barako Coffee Jelly– absolutely free ! “Reyes Barbecue is a family-oriented restaurant, and Dads are the family’s backbone, caring and providing for the family throughout the year. 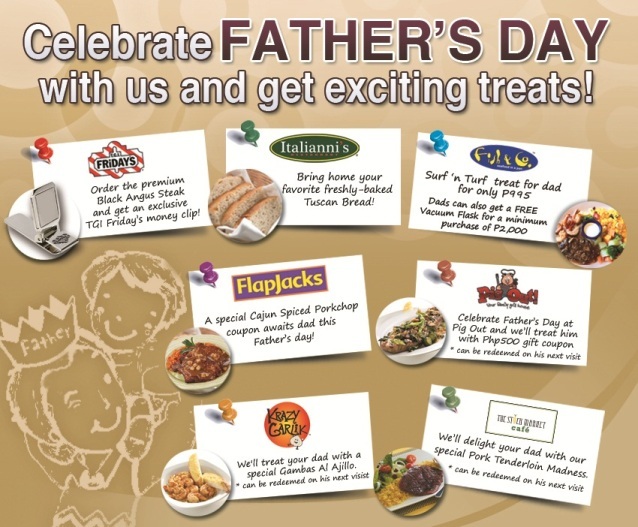 We are happy to honor and give a treat to all Dads on their special day, and starting this year, Reyes Barbecue will make it a tradition to have better treats for all Dads on Father’s Day,” says Frank Reyes, Founder-CEO. Check out our various group meal combo for your great family barbecue celebrations: 1 Boneless Chicken Barbecue Meal , 1 Grilled Bangus Belly Meal, 1 Two Pc Pork Barbecue Meal, 1 Grilled Pusit Meal, 1 Bilao of Pansit Canton (or Spaghetti or Garlic Sotanghon), 2 Pitchers of Nestea – all for around P1,055 –complete with FREE Barako Coffee Jelly for ALL DADS in the group ! Available at the following Reyes Barbecue stores : SM Mall of Asia, SM Bicutan, SM Las Pinas, SM Marikina, SM Supercenter Pasig, SM City Bacoor, SM City Marilao, SM City Baliwag, SM City Pampanga, SM City Clark, SM City Tarlac, SM City Lucena, SM City Naga, Robinsons Galleria, Nuvali Sta Rosa, UP TechnoHub, Pavilion Mall Laguna, Venice Piazza McKinley Hill The Fort, Waltermart Makati, Shangri La Plaza Mall, Cash & Carry Mall, 168 Mall, and Divisoria Mall. You ask of it, now it's back bigger, better and more chicken!!! Max's Chicken All-you-can daily from June 10 - July 10, 2011 from 6PM - 10PM, with a glass of Pepsi for only P199.00. Add another P28.00 to go bottomless. If you have joined last year's campaign, then you know you have to be early in line... haha. 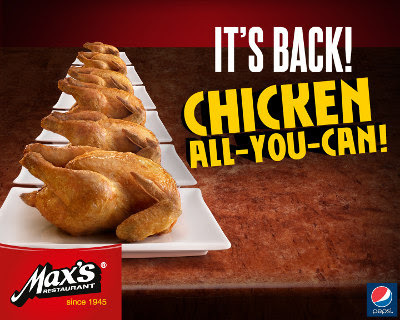 As an added treat, Max's is giving away P20 coupons for every P200 spent during the chicken-all-you-can promo, which you can use to buy other Max's delights. Maximum of 3 coupons to redeem for a transaction. 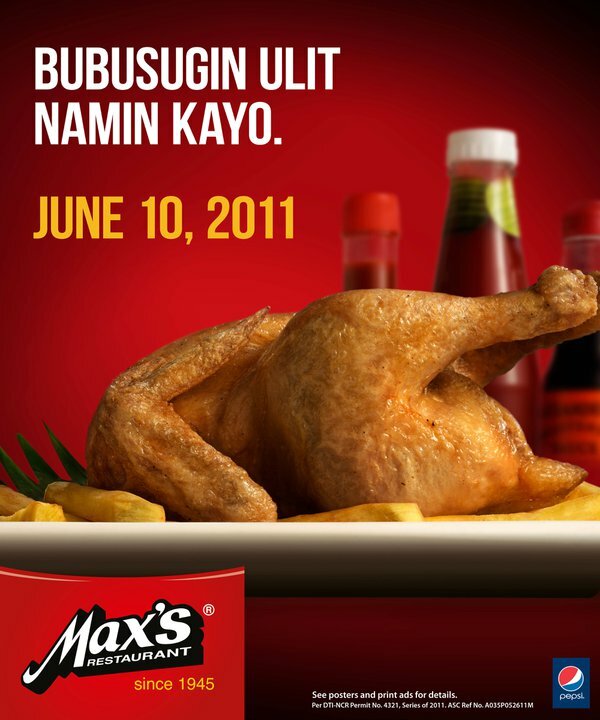 See you at Max's! Last year I was able to munch on 8 pieces, thats almost 2 whole chicken!! haha enjoy it while it lasts!!! It was a sunny day and what a hot day it was, we got to visit Ayala Westgrove Heights community in Sta. Rosa, Laguna. Enjoy the delights of living in an Ayala Land community, adorned by thick follages of mango trees and visually enriching amenities, including a 400-hectare orchard environment that encourage serene living alongside the people you want to be surrounded with. Located at the heart of the flourishing Calabarzon region, Ayala Westgrove Heights is a suburban address that creates the ideal neighborhood for budding families. Indulge your passions and interests in this thriving community. Look at all those fresh Apple-Mangoes, wifey picked a few and loved it, the best ones she has tasted so far and she knows her Apple-Mangoes. And to continually distinguish Ayala living and enrich the culture of life at Westgrove Heights, ALP hosts another open house event called Westgrove Festival as part of the property's year-long celebration of its 12th anniversary. 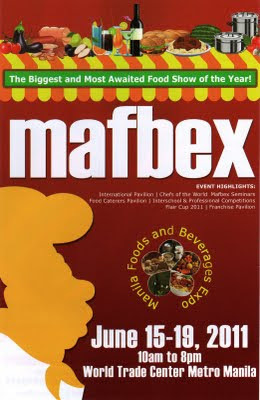 Being the only one of its kind, the festival opens the doors of the vibrant community to renowned dessert chefs such as Sau Del Rosario and Buddy Trinidad, together with prospective residents. Enjoy the sweetness of Westgrove mangoes through the chefs' delectable mango creations. Chef Buddy Trinidad, showcased his love for mangoes. With Lori Baltazar of http://dessertcomesfirst.com/ guiding us on how it is done. His creation, Mango Crunch, a crusty blend of crushed corn flakes, yummy tapioca, creamy and delicious, topped with fresh mango from the trees of Ayala Westgrove Heights. It was indeed a delightful mango dessert treat. Best served when chilled. We also had Chef Sau Del Rosario, one of the most sought after chef in the metro, defines his love for desserts and how a simple dessert can be made exceptional. Mango panna cotta, a dessert so simple to make, but made with the right hands such as Chef Sau has, can be exceptionally good. The best and freshest panna cotta I have ever dipped my lips on.. Since the goodness of summer does not end in sweet delicacies, Ayala Westgrove Heights continuously captivates its residents with its naturally distinct features and vibrant enhancements that complement the relaxing yet unique lifestyle that families and communities take pleasure in. Indeed, the 12 years of Ayala Westgrove Heights simply emphasizes Ayala land's delivered promise of intelligent master plans, modern living environment, and uncompromised living experience.